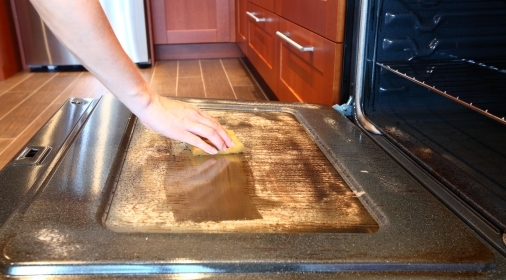 Thinking of cleaning your oven? With so many products, tips and hacks floating around it can be hard to know which ones actually work! Many oven cleaning products now use toxic chemicals which are high in fumes, and damaging to the environment. Steaming your oven is easy, safe and completely fume and chemical free! Using an oven safe bowl, fill with water and place on a shelf in the oven. Set your oven to 450°F and leave for 30 – 60 minutes, depending on how dirty your oven is. Remove the bowl, and leave your oven to cool. 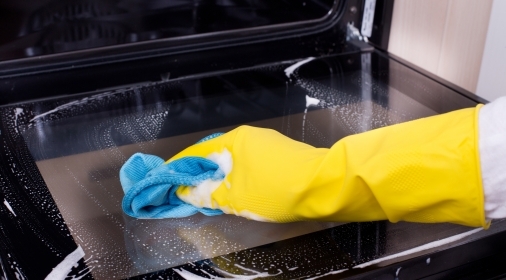 Once your oven has cooled, wipe down the oven with a clean cloth. This will wipe away the condensation created by the water bowl, and remove any grime. Tip: If you have any stubborn areas that don’t wipe away, use bicarbonate of soda and white vinegar to remove the grime. Tip: If you would like to give your oven a nice scent, put a few slices of lemon in the water mixture! If you would prefer to leave it to the professionals, our Ovenclean specialists can get your oven glistening in no time! Call us on 0800 840 7127, or complete our online form for your free quote.